Put your best foot forward with our Hands on History event on Saturday! Visitors attending the session will be invited to get hands on with many items of clothing, learn more about the historical fashion trends they reflect and hear about the stories surrounding the objects. 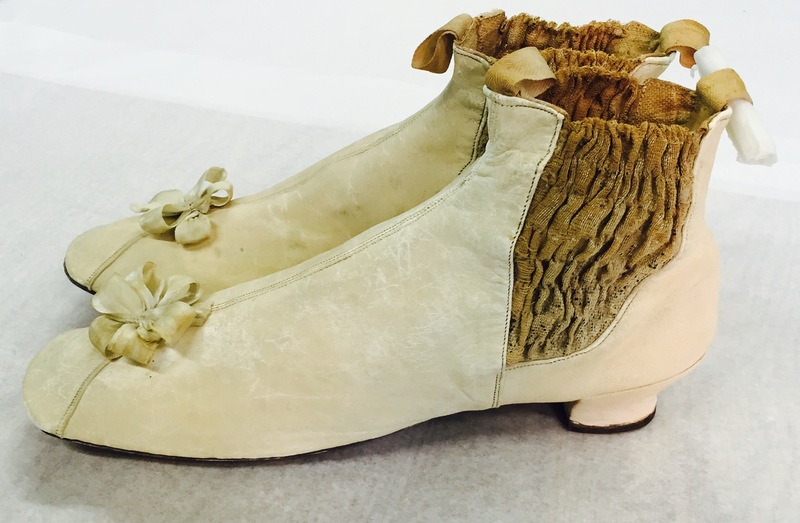 There will be the chance to learn more about George Eliot’s life and to read a new poem inspired by her boots! One of the objects has a bridal connection, having been worn by a local bride on her wedding day. The other object has a literary connection, having belonged to Nuneaton born writer, George Eliot. The object, she once owned and wore, is a beautiful pair of cream, kid leather ankle boots each adorned with a silk rosette. Due to their delicate nature these artefacts are for viewing only. Hands on History sessions are free and there is no need to book. Drop in on August 20 between 11am to 4pm in the Yellow Gallery, where visitors can also take part in [B]lab and provide us with feedback on the 5 unique stories we are presenting each week.